Skin Parasites can be frustrating, annoying, and downright painful! Here at All About Parasites you can learn how to deal with the various parasites that attack your skin so that you can have relief as soon as possible. If you've ever had a case of lice (who hasn't? ), or been irritated by the constant nipping of fleas, you know exactly how aggravating parasites that attack the skin can be. You're scratching, slapping, soothing, digging, and virtually losing your mind with the constant discomfort. Perhaps you've had to pull ticks from your children after an afternoon of roaming around in the woods or fields. Maybe you've experienced the painful infection of ringworm or suffered with the agony of scabies. Even though each of these little critters have different methods of driving us insane, they have one thing in common. They are all skin parasites! These Bugs Are Driving Me Crazy!!! If you have creepy crawlies that are giving you fits, here are some tips to help you kill off skin parasites. This is no time for sympathy and compassion when it comes to parasite remedies. You have to be ruthless. If you give these guys an inch... ...well, you know what happens. 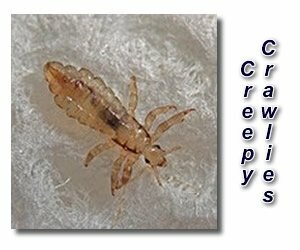 Lice - There are three varieties of lice that are known to attack the skin of humans. Of course, the most well known is head lice. Kids tend to be the most common carriers of head lice because they play in close proximity to each other, making it easy for the lice to travel from head to head. Body lice are much less common and are more likely to be found in the clothes and body of indigent (homeless) people. The third and final type of louse that feeds on human beings is the crab or pubic louse. Although slightly different in appearance, these are very similar to the head lice. Instead of finding them on the head, they are found in the pubic and armpit hair, and sometimes even facial hair. These lice are generally passed through intimate or sexual contact. 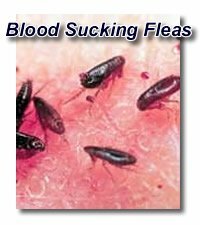 Fleas - Fleas primarily attack animals, but are quite happy to feed on humans if they are readily available. They are able to jump to remarkable lengths for such tiny little insects. Flea bites, not only sting and itch, but can also become infected when scratched. It is also known that fleas can carry various diseases like plague and typhus. Scabies - Scabies, also referred to as the itch mite, is a very frustrating creature because it causes such severe itching. The female itch mite burrows under the top layer of your skin and lays eggs there. Disgusting, I know. The tiny burrow looks like a fine wavy line with a little pimple at one end. You may have trouble identifying these skin parasites because the skin may be red and scratched as a result of you itching and scratching it. There are topical creams that you can purchase to apply after you take a nice hot bath. If you'd like to try a natural remedy first before resorting to a synthetic solution, there are a lot of options. The one I recommend is Tea Tree Oil. Add 10-20 drops of pure Tea Tree Oil to your warm bath and soak yourself completely. If you do this a few times a day, it should kill the parasite and sooth your itchy skin. Don't expect your symptoms to be gone overnight, though. For some people, the itching will take a couple of weeks to completely disappear even after the mite is dead and gone. Ticks - Ticks are small bloodsucking little creatures that can really cause you problems if they are undetected and allowed to infect you for a long period of time. Tick skin parasites cause various fevers and diseases depending on the type of tick in the region where you live. 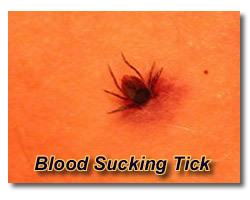 You can sometimes feel a tick on you when it first bites you, but after it starts sucking your blood, it usually can't be felt. That's one of the reasons it is so important to check yourself and/or your children if you have been spending any time in tick infected country. Once a tick burrows in, it doesn't want to let go. It is important when removing ticks that you are sure to get the head and legs that burrow under the skin. People use different household items to help make the ticks release easily. Some try coating them with nail polish or Vaseline (petroleum jelly). Others try smothering them with kerosene, turpentine, or gasoline. That seems a bit harsh to me, and only should be used in an emergency. One of the simplest and safest options is to just dab the tick with Tea Tree Oil. If you wait about 10 seconds, you can then remove them with tweezers very carefully. Once you have removed a tick, wash the area well with soap and water. Ringworm - Ringworm, also known as Tinea, is not actually a worm. Ringworm is a fungus, and can come in many forms. You can get it on your head, the inner thighs (jock strap itch), the feet (athletes foot), the nails, and various parts of the body. Ringworm is usually characterized by a red ring that forms on your skin. Ringworm is also extremely contagious. That's why children in day care centers seem to pass it around so readily. It can transfer through direct contact, contact with contaminated clothes, combs, hats, etc. Two home remedies you can try for parasite removal of ringworm are these. The first one is pure tea tree oil. You can try it straight, or diluted with a bit of water. Apply it directly to the spot several times a day. The second option is to make a mixture of bleach and water 50/50 dabbed on the ringworm spot a couple of times a day. For either option, please use a new cotton ball or Q-tip for each dip so you don't contaminate the mixture. Also, continue the treatment for a couple of weeks even if you think the ringworm is gone to be sure you've gotten it all. These are just a few of the most common skin parasites you may encounter. If you happen to contract a parasitic infection of the skin, don't panic. It is not necessarily a sign of poor hygiene or being "dirty," as some people used to think. It is a very common occurrence, and skin parasites can be contracted by anyone. Do try to rid yourself of the skin parasites as quickly as possible. Don't forget to wash your clothing, towels, and bed linens so that you are not re-infected. If you have any further questions, or would like to offer a tip or home remedy, please do add it here for everyone's benefit. Parasites In Truck Air Conditioning? Not sure if me and my kids have a parasite??? If I'm Crazy, Why Am I Itchy? Black Hair Like Things near my pubic area. Small Brown Spider Looking Thing? Am I Crazy Or Is Something Biting Me? Horrifying Out of this World Phenomena in my Home! Is anything known about this creature? What Is So Itchy On My Skin? I can't see them but I can sure Feel them getting me! Can you help me find an answer to parasite problem? How do I get rid of a skin parasite? Can Parasites Get In Eyes? Can Types Of Fly Use Human As A Host? What kind of worm or insect is this? Something seems to be growing under my scalp?? I Have Bugs On Me! Little spots of black tar? What kind of parasite do I have? I Think I Have Worms! Black Threads That Burrow Into Skin? Zit with a bug in it??? Is Dandruff A Potential Sign of Ringworm? What Could Be Biting Me At Night? Do I have skin parasites? What is this bug, and How do I get rid of it? I have something under my skin!